India and China on Friday acknowledged that they have differences on issues like OBOR, NSG and Masood Azhar which have to be addressed seriously by them even as Prime Minister Narendra Modi asserted that sovereignty and regional integrity should be respected on connectivity, in remarks that come against the backdrop of opposition to Beijing's One Belt, One Road initiative.Modi met Chinese President Xi Jinping on the sidelines of the Shanghai Cooperation Organisation (SCO) Summit here and held discussions on a range of issues, including China's reservations over India's entry into the Nuclear Suppliers Group and UN sanctioning of Pakistan-based terrorist Masood Azhar. "The sense of the meeting was that the two countries have great benefit, great interest in working with each other and we will have differences. "But where we have differences, how do we work through those differences, find common ground where they are possible. And also a sense that wherever we have concerns, each side will look at it with a degree of seriousness," Foreign Secretary S. Jaishankar said while briefing the media about the talks between the two leaders.He was asked about the various areas of differences between the two countries including India's reservations on OBOR, the China-Pakistan Economic Corridor (CPEC) forming part of it and Beijing's opposition to India's membership of the NSG and UN sanctions on Pakistan-based terrorist Masood Azhar. Jaishankar said the broad thrust of the meeting was that at a time of global uncertainty, India-China relations are a factor of stability. "I think there was also an understanding that where we have differences, it was important that these differences should not become disputes and, in fact, if they were handled well, they could even be opportunities," he said.On India keeping away from the OBOR forum, the Foreign Secretary said these was discussion on connectivity and how the two countries could work together. In fact, the Asian Infrastructure Investment Bank and the BCIM corridor came up for discussion, he said. With Xi listening to him, Modi, in his speech at the summit, made oblique reference to India's concerns over OBOR and CPEC saying sovereignty and regional integrity should be respected while Pakistan Prime Minister Nawaz Sharif, whose country is partnering China, hailed the project. "For connectivity initiatives and for success and approval of the projects, sovereignty and regional integrity must be respected while inclusivity and sustainability are essential," Modi said.Avoiding any direct reference to OBOR and and CPEC, he said India joining the International North South Transport Corridor and the Chabahar port agreement and the decision to join the Ashgabat Agreement will bring India closer to these places.Sharif said the Belt and Road initiative transforms the global economic landscape. "And in Pakistan we are diligently implementing the China-Pakistan Economic Corridor which is the flagship of the BRI. What is more, these mega projects will benefit the entire SCO community," he said. The issue of terror also figured at the summit. Amidst the ongoing India-Pakistan chill, Modi called for coordinated and strong efforts to fight terror and radicalisation, particularly recruitment, training and financing, giving a veiled message to Islamabad. "Terrorism is violation of human rights and basic human values. The fight against terrorism is an important part of the Shanghai Cooperation Organisation (SCO). Whether it is the issue of radicalisation, recruitment of terrorists, their training and financing, unless we take coordinated and strong efforts, it is not possible to find a solution," Modi said.On Thursday night, Modi and Sharif exchanged pleasantries at a cultural function hosted by Kazakhstan President Nursultan Nazarbayev. The informal interaction came 17 months after Modi's surprise stop over in Lahore to greet Sharif on his birthday and attend a pre-marriage function at his residence on December 25, 2015.Hailing the SCO's efforts in the fight against terror, Modi expressed the hope that the eight-member Eurasian bloc will give a new direction and strength to this fight. 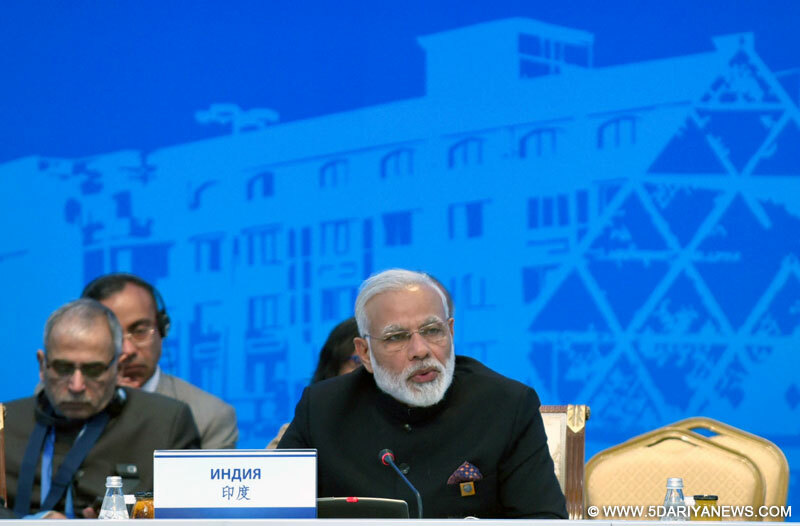 Sharif, whose speech followed that of Modi, said: "We fully endorse the SCO's resolve to fight the twin evils of terrorism and extremism. ""Pakistan has fought its own fierce war in the fight against international terrorism and, with the grace of God, it has been able to achieve a turnaround in the security and economic situation in our country," Sharif said.